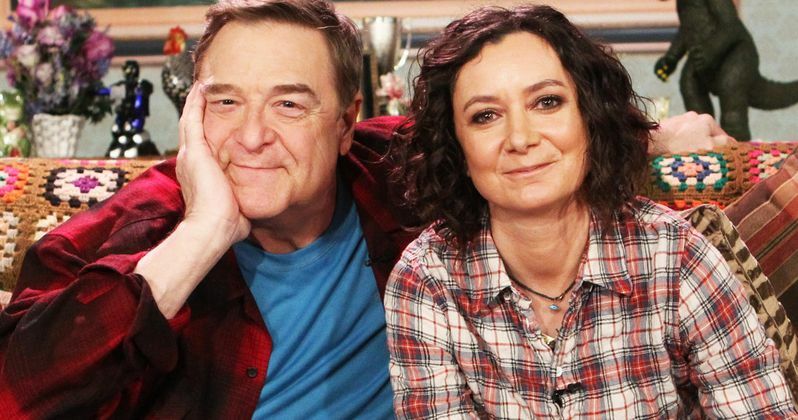 It looks like Roseanne may well continue with just about everyone except the star the show is named after. ABC has been scrambling to figure out what to do in the wake of the show's cancellation, which came as the result of a racist tweet Roseanne Barr posted then deleted about President Obama adviser Valerie Jarrett. Now it appears that the network is trying to rally and is looking at hinging a new show centered on Sara Gilbert's character Darlene Conner. According to multiple reports, ABC is having meetings in order to try and shift the focus of the series on Sara Gilbert with a tentative title of Darlene. Gilbert is reportedly very much on board with the idea and has been speaking with the other cast members to gauge their interest in the potential spin-off. John Goodman is said to be very interested. That raises a whole host of questions in regards to how they would explain Roseanne's absence, but the writers can work around that. After all, they had to explain how Dan was still alive after dying of a heart attack during the final season of Roseanne's initial run. We previously reported that ABC was potentially looking at some sort of spin-off to help fill the gap now left in their programming schedule next season, but there are other issues that something like a Darlene series will bring about. Most notably, Roseanne Barr created the series and the characters, so she would be entitled to compensation should a spin-off movie forward. That is, unless ABC finds a way around that. They're certainly not going to risk the terrible PR storm that would come their way should they move forward with something that will still benefit Barr financially. Another important reason is to try and save the jobs of the other cast members and crew, who are going to lose their jobs as a result of Roseanne Barr's comments. If the network can find a way to make something like Darlene work without having Barr involved, those jobs could be rescued. Sara Gilbert took to Twitter to express her disappointment shortly after news of the cancellation broke. "Roseanne's recent comments about Valerie Jarrett, and so much more, are abhorrent and do not reflect the beliefs of our cast and crew or anyone associated with our show. I am disappointed in her actions to say the least. This is incredibly sad and difficult for all of us, as we've created a show that we believe in, are proud of, and that audiences love, one that is separate and apart from the opinions and words of one cast member." The Roseanne revival was a ratings monster for ABC, so they would love to find a way to recoup some of the advertising money they're set to lose next season as a result of the cancelation. But it's been made clear by Disney CEO Bob Iger and other top brass that this was the right and only move to make. Barr has since tried to blame her comments on Ambien, but that didn't go over particularly well. The damage is done and now ABC, as well as the rest of the cast, are simply in damage control mode. This news was first reported by TMZ.